Thurston, Astrid and Norma's combined weight is half of Charlene's weight. The kittens all weigh the same. If Charlene weighs twelve pounds, how much does each kitten weigh? Yep. That's right. Two pounds. It always comes upon us so fast!! TOO FAST! Charlene only weighs 12 pounds? I guess the floof really *does* make her look bigger. 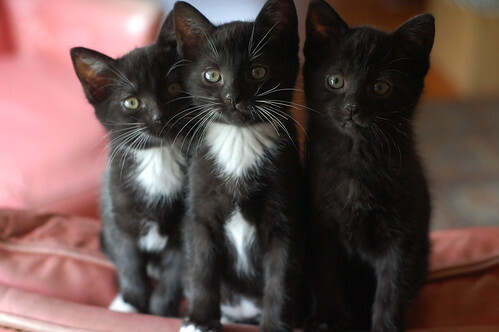 I hope all three little sweetie-pies get to find one home together. Laurie, you all give way too wonderful care of the itty bitties and make them go away too quickly. But, it just means we might get to meet a new litter that much sooner, which means that much more space for the next ibk's in need! Already?! But... but... they just GOT here! oh my, they started out so little... how'd it happen soo fast??? YES, they all three need to go to ONE home. And my home is too far away, sorry kids.... sigh. This time goes faster with each litter, it seems! Hope they find A (singular) fabulous family to charm and love. If only my math teacher used kittens as a tool, I might have been better at it! Echoing the cries of oh no!! These Easterbrooks are just so adorable. :( But of course, it's a good thing that they are so healthy and gained weight so quickly.